SOUTECH Web Consults – (a smart and ambitious Abuja based Tech startup) is looking to hire very smart people for an internship program engagement. He or she will manage support tickets and client follow ups (calls, email, livechat, social media); Work closely with the CEO (Business Assistant) and other team members; Assist in the development and execution of our PR strategy; Constantly seek out fresh leads and maintain relationship with existing clients; Proposal writing and other content devlopment; Work with the Marketing and Tech team to create innovative campaigns and be involved in Planning and executing of projects. >Great communication skills and a people’s person. If you’re passionate about coding, fluent in database architecture and know CMSs/PHP API inside and out, we need you. You will be responsible for developing plugins and themes, customizing existing plugins and themes, handling technical support, fixing bugs, building and maintaining websites, training, etc. Your strength must cut through both the front end and the back end of any CMS. We’re scoping out for a massively talented, detail-obsessed and creatively outstanding digital graphics designer with a love of all things digital to join our Team. The ideal candidate Should be proficient with Adobe Suite and also have a portfolio that they can share during the interview. Basic knowledge of CMSs and marketing is required. SOUTECH young and vibrant Web solution marketing team is growing with the company and we have a job opening focusing on web solutions product marketing. In this exciting position the successful candidate will initiate, orchestrate, and manage marketing programs and strategies of the company’s associated product families with significant revenue impact. Plan and execute comprehensive outbound marketing efforts around responsible storage systems, including driving the marketing strategy in terms develop tailored product positions and messages that resonates with target market segments. Responsible for creating marketing programs that helps generate top line growth including working with a cross function team to develop the program, oversee the execution, track progress, and measure quantified success. Create product collaterals and web content that effectively communicate product strategy; conduct trainings for both internal and external audiences. Ensures positive working relationship with and coordination between marketing efforts of the business units, the field and the channels. Complete understanding of and experience in life-cycle marketing, including launch, transition, and end-of-life, through direct sales and indirect channels, using advertising, direct marketing, promotions, and seminars. Strong skills in outbound marketing, messaging, transitions, and business data analysis. Strong understanding of core technologies and their implications for the market. Strong, positive working relationships both internally (peers, managers, subordinates) and externally (customers, partners, sales force, indirect channels, press analysts). The Ideal candidate for all the openings is expected to have bucket loads of common sense, be a good team player, unrepentant workholic and a fast learner who can take control of projects, define technical specifications and interact directly with our users and clients. Every team member should be willing to work across a large range of assignments, since this is a startup where everyone has to wear multiple hats every week. 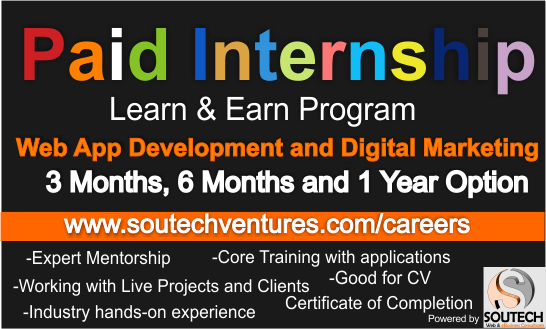 Competitive internship package- allowance (always paid on time) and extensive training supervised by dedicated mentors. Help us share this, there may be people in your circle looking for an opportunity like this. Interns will be screened for full time placement after completion of program. If you are looking to become an expert professional in IT & eBusiness Consulting these might be your golden opportunity.